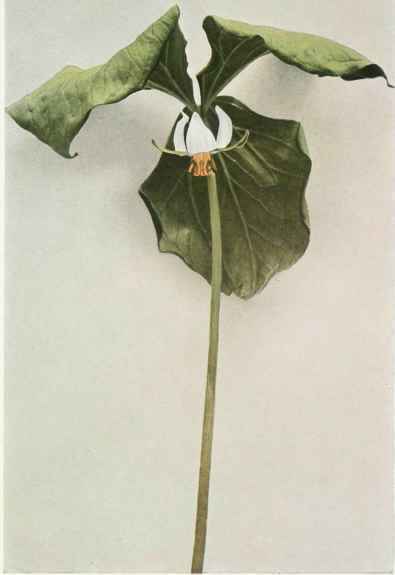 Stems rather slender, 8 to 20 inches high; leaves pale green, broadly rhombic, acuminate at the apex, narrowed at the base, sessile or with very short petioles, peduncle one-half to 1½ inches long, recurved beneath the leaves and bearing a single drooping flower about 1 to 1 ½ inches broad, sepals lanceolate or ovate-lanceolate, acuminate, petals white or pinkish, ovate-lanceolate or oblong-lanceolate, rolled backward, wavy-margined, two-thirds to I inch long, as long or longer than the sepals; anthers about as long as the subulate filaments and overtopping the stout, recurved styles, ovary whitish, ripening into an ovoid reddish-purple berry. In rich, usually low woodlands Newfoundland to Ontario and Manitoba, south to Georgia and Missouri. Flowering in May or in the extreme northern part of its range in June, usually about ten days later than the white or red trilliums.